On Monday 31 March, the Frontline Club hosted a screening of First to Fall, followed by a Q&A with the director of the film, Rachel Beth Anderson, and its co-director, Tim Grucza. First to Fall follows two Libyan young men, Hamid and Tarek, who return to Libya from Canada during the conflict in 2011. The two friends, both in their twenties, are troubled by the events in their home country, and feel that they must join the fight against Gaddafi. They soon find themselves in the middle of the fighting, despite their lack of military training. The film places the journeys of Tarek and Hamid at the centre of the larger context of the conflict, documenting their different experiences of the war. One audience member pointed out the noticeable lack of women in the fighting and movement for freedom. Anderson was asked whether she felt that her being so close to the fighters was a problem. She explained that everyone fighting recognised the need for Western journalists, for people to document and broadcast the events. As she met both Tarek and Hamid so soon after they had arrived in Libya, she was able to build a relationship with them and gain their trust. She described how important it was to be introduced by someone trustworthy. Many of the questions asked by the audience focused on the lives of Tarek and Hamid, particularly what happened to them after the film ended and where they were now. Anderson and Grucza told the audience that they were still in touch with both men, but, sadly, they are no longer in contact with each other. Hamid is still living in Libya, working for the government, but unhappy and disillusioned with the new Libya. While the rebels were celebrated and admired during the conflict, he describes how many are now treated poorly and labelled as ‘gangsters’. There were many regional tensions between rebel groups in the aftermath of the conflict; the groups were all united by their hatred of Gaddafi, which ended once he had been killed. However, he disagreed with an audience member who suggested that the end of the film would lead to the conclusion that the conflict was ‘futile’; despite the fact that Gaddafi was gone, the two central characters of the film did not have happy endings. He said that the film’s end was not the end in reality; Tarek and Hamid are small ‘pawns’ – their story is one very small piece of a much larger picture. The film had its world premiere at IDFA in November, and was part of this year’s Human Rights Watch Film Festival in London. 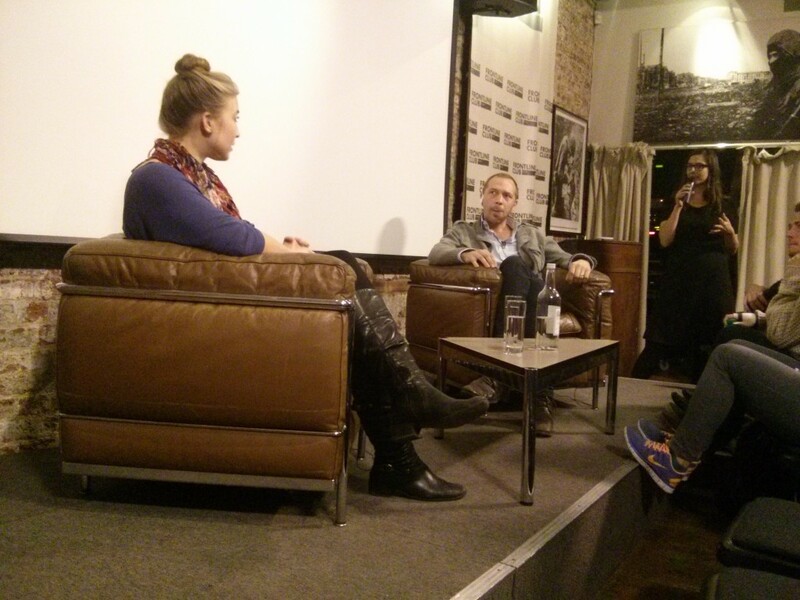 The screening at the Frontline Club marked the end of a week of UK screenings, but more are planned for the future. Hopefully Hamid will be able to attend a screening that is being planned in Canada so he can see the film. More information about the film and dates of any future screenings can be found on the film’s website, Facebook or Twitter.